Jeanne’s Bags are handmade, one-of-a-kind quilted purses, custom crafted with care right here in America. No two bags are the same! Choose your own fabric and special pocket and strap length options for your piece of fun, functional art. Buy a gift certificate for special occasions! 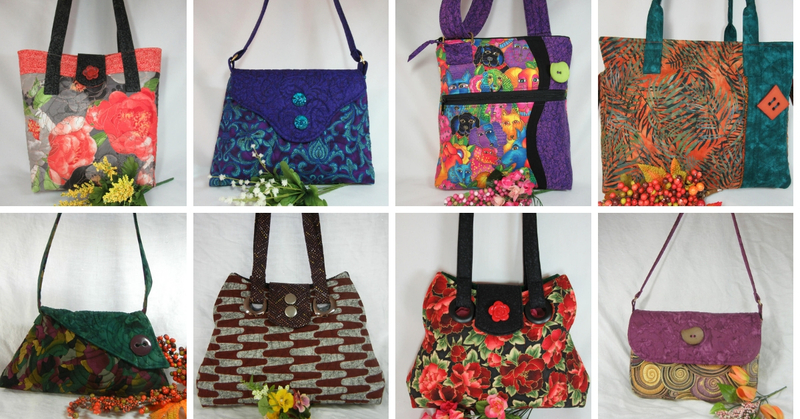 Ready-made purses are for sale in our Etsy shop, in our Handmade at Amazon shop and here in our Buy Ready Made page under Shop. JEANNE IS STILL RECOVERING FROM HER BROKEN ARM, BUT HAS BEEN ABLE TO START SEWING AGAIN! IF YOU NEED A PURSE MADE BY A CERTAIN DATE, PLEASE ALLOW A LITTLE EXTRA TIME WHEN PLACING YOUR ORDER. THANK YOU FOR YOUR UNDERSTANDING.